The original Zenbook was one of the first Ultrabooks unveiled and even to this day it takes some beating. The follow-up for 2012 – the Asus Zenbook UX32A – boasts much of the same excellent build quality with some of the components scaled down to make it affordable. Part of the appeal of the original Zenbook was the head-turning design and, in that department at least, nothing has changed. The Zenbook Prime keeps the sleek, aluminium build that has become a staple of Ultrabook heritage. Slightly thicker at the hinge end at 14mm the Zenbook UX32A has a wedge-shaped look similar to the original Zenbook and the Apple MacBook Air. At its point in measures a tiny 8mm. 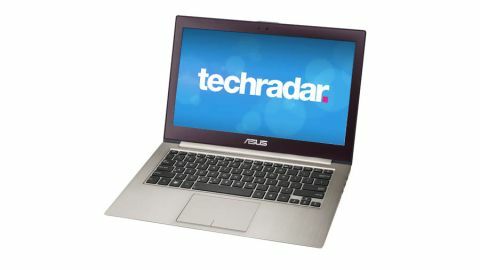 Asus has kept the concentric circle design that now not only adorns its Zenbook range but also premium tablets like the Asus Transformer Prime and Transformer Pad Infinity. The circle design throws light back like the spokes of a wheel and gives this machine a premium sheen that we don't get from the solid silver of the Sony T13 Ultrabook or the black glass of the HP Envy Spectre. While looking pretty on the outside, the Zenbook comes with a less-than-flattering internal specs sheet. Our 13.3-inch review model came with an Intel Core i5-3317U processor clocked at 1.7GHz along with 4GB of RAM and an integrated HD Graphics 4000 GPU. These components don't put out the barnstorming benchmark results we'd see with an Ivy Bridge Core i7 machine, but they bring the Zenbook down to more affordable realms of Ultrabook computing.